Each is noted at the end of the title, [ie #CuzitsCustom Paws (Small-OEM) or #CuzitsCustom Paws (Small-Willys)]Please note that these are made to order and 100% custom. They are sold here as one-offs in the material and color you chose. This item does not include double side stick tape. The tape you will need to install this on your vehicle can be purchased at your local auto parts or hardware store (I personally use 3M brand automotive trim tape). 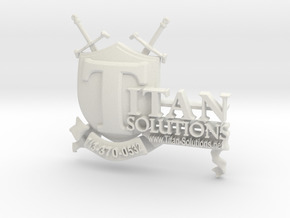 Standard turnaround time can be a minimum of two weeks. Rush ordering is available at an extra cost. Custom Creations & Custom Painting is available too, please contact me at nicholas.hall@254multimedia.com or cuzitscustom@254multimedia.com if you need any custom work done.Disclaimer: “Cuz it’s Custom’s” 3D Printed Emblems are not affiliated with “Jeep” or “FCA US LLC” in any way. Please remember that “Cuz it’s Custom’s” 3D Printed Emblems are the custom creation(s)/ design(s)/ work(s) of 254 Multimedia LLC. 254 Multimedia LLC cannot guarantee an “exact match” or “exact fit”, because every order is a made-to-order-one-off. 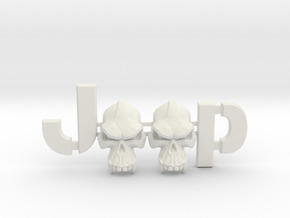 Furthermore this is intended as a decorative after-market accessory and does not say or represent “Jeep” in anyway. 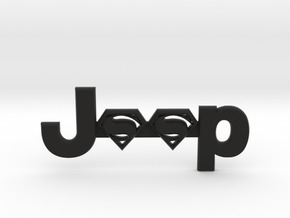 The trademarks, service marks, logos, trade names, and any other proprietary designations of “Jeep” used herein are trademarks or registered trademarks of FCA US LLC. Any other trademarks, service marks and trade names are the trademarks or registered trademarks of their respective parties. Chrysler, Jeep, the Jeep Grille, Rubicon, Sahara, Wrangler, Command-Trac, Freedom Top, Mopar, and Trail Rated are registered trademarks of FCA US LLC.